This week, Republican National Committee Chairman Reince Priebus refocused the Republican Party ahead of the midterms. In his speech, Chairman Priebus broadly went over the Conservative principles and ideals that are energizing Republican and many Independent voters. With the 2014 midterms just a month away, and as we reach out to our family, friends and neighbors ahead of election day, it is important that we remember this important fact: when conservative principles are being campaigned on, Republicans win on the ballot. Chairman Priebus is tasked with advocating the party platform and broader concepts. This is a step in the right direction and, as a movement, we are grateful he took this important step in including core conservative principles in the national dialogue just a month ahead of this critical election. Now it is time for voters to elect conservative leaders who will advocate legislation which will result in turning these principles into law which will improve the lives of all Americans. There are far too many politicians in Washington who are focused on maintaining their own power and influence. They are not willing to stand tall and advocate principles that may not be popular in the backrooms of the nation’s Capitol but are popular among the majority of Americans. I am proud to stand with other strong conservative leaders in calling on Members of Congress to take action. Conservative principles are popular and effective. They make the lives of Americans better. Conservative ideals create jobs, sustain economic growth, and preserve the vision of liberty and advancement of our Founders. It is time for the Republican Party to return to the principles, the very foundation of our movement, that have made our country a better place for its citizens. We must enter the home stretch of this election cycle. Boldly holding firm to the issues are on our side. As we send more conservatives to Washington, D.C., we must work to enact long overdue economic reforms. It is high time we have Republican leaders advancing the causes they claim to hold dear and we know to be effective. A new initiative was launched this week at ConservativeReview.com to make sure that happens. As November is rapidly approaching and some states are tightening up, it is vitally important that we do all we can for conservative Republican candidates across the map. President Obama himself said that his policies are on the ballot come Election Day. According to Real Clear Politics, an average of 66 percent of Americans believe that the country is on the wrong track, and only 42 percent approve of President Obama’s overall job performance. You don’t have to be a political scholar to understand that President Obama and his policies have been firmly rejected by the American people. It is clear now more than ever that Americans want real change. 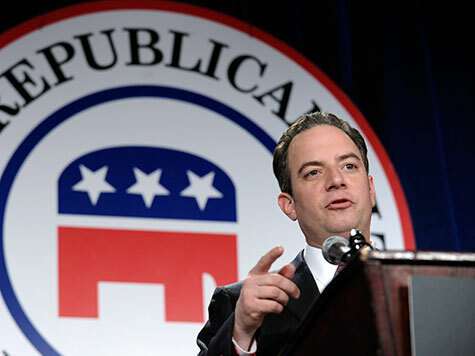 Chairman Priebus hit many of the right notes this week in refocusing the Republican Party. We all must be united so President Obama cannot inflict more damage on our nation in his last two years in office. The time is now to come together and make sure we stop President Obama in his tracks.